Kampen om Norge is a military game recreating the Norwegian defense against the Germans during WWII. 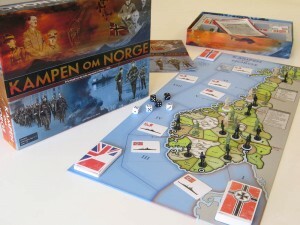 The Norwegians and Allies are handled separately so playing with 3 players is straightforwards, and one player plays both Norwegians and Allies individually in a 2-player games. Players take turns moving any of their units, resolving any combat where opposing units are in the same space, adding reinforcements, and then gaining new cards. The goal for the Germans is to control all the cities before the game ends when their card deck runs out (although destroying all enemy units will work as well). Combat is resolved by both sides rolling 1 dice for each unit involved and comparing the totals. However, unlike what you may expect, the loser must withdraw and it is only natural results of 6 on a dice that destroy enemy units. This seems like an interesting system as it makes area control the focus of the game which fits with the invasion setting, plus it makes weight of numbers a key factor.